The monster known as Damage is now in the possession of the Justice League. But with the literal ticking time-bomb inside the Hall of Justice, what can the League potentially do to stop the unstoppable? If Superman himself struggled to bring this monster down what can the heroes hope to do to keep another destructive rampage from happening? Well, one particular Leaguer has an idea. With Ethan having made his decision, Batman reveals that they aren’t at the Hall of Justice, but rather on Batman’s Batcarrier air transport. “You want to be your own man, Ethan? Good luck.” Batman then opens the cargo door of the carrier to drop Ethan out. Ethan then makes the decision to unleash Damage to kill the Dark Knight. Batman uses his arsenal of gadgets and weapons on Damage, but to no effect. This results in Batman ending up with three broken ribs and a trashed plane. But while Damage is doing the fighting, Ethan realizes something. He thinks to himself and Damage that Batman could have ended this fight one way or another by now, so he must be stalling. This proves to be right as Batman holds Damage off long enough to reach an escape pod and sends the carrier and Damage crashing onto an island. As Damage crawls out of the wreckage, he finds himself surrounded by monsters of every kind before coming face to face with a very angry looking dragon. Batman dropped the monster known as Damage on Monster Rock. I was curious as to how the Justice League was going to deal with a monster like Damage. So far, no one has been able to stand up to him. He’s defeated the Suicide Squad, Wonder Woman, Flash, Green Lantern and Vixen. The fact that Superman said he’s never been hit as hard by anyone else says all it needs to, but the question arises: where is this all going? 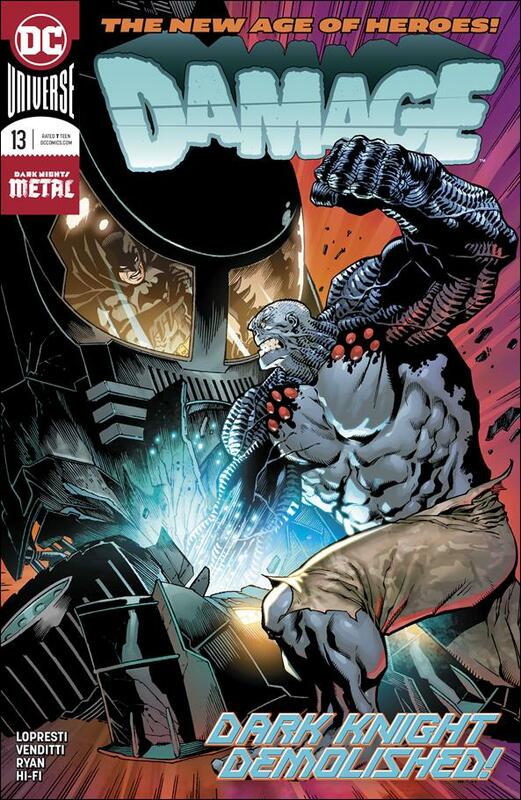 Unfortunately, like pretty much every other new title that came from Metal, Damage is getting cancelled. So, what happens with Ethan? Is he a blatant Hulk rip-off with a few differences? Yes. However, I have enjoyed the series so far, and I see massive potential for what the character can become. However, with his own series set to be cancelled, perhaps we’ll see him pop up elsewhere. Do I see him becoming a full-fledged member of the Justice League? As of right now, no chance. But I think completely erasing the character would be a mistake. From a story standpoint though, what can Ethan do? He’s trapped on an island filled with dangerous monsters and his time as Damage only lasts so long. Can he find a way back to America? Can he even survive long enough to get that far? Hopefully, unlike Immortal Men, we actually get an ending to this story before the final issue is over.